The combined efforts of three volunteer organisations saw a local child with Spinal Muscular Atrophy receive a much welcomed piece of equipment. 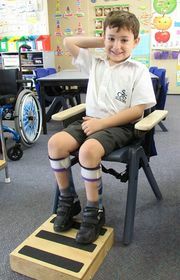 Finn, a student at St Columba School in Port Macquarie, was provided with an Access Platform and Rail. 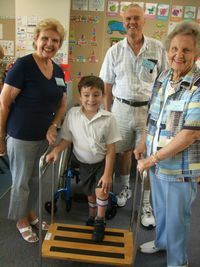 The Port Macquarie Evening Branch of the Country Women’s Association recently made a generous donation to the local TAD Disability Services (TAD) group. 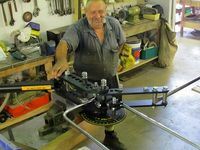 This funding enabled the TAD volunteers to purchase a Tube Bender, which is an important tool in fabricating the frame of the Access Platform and Rail which Finn required to assist his transfer into and out of a motorised wheel chair. The TAD group then sought the assistance from members of the Port Macquarie Men’s Shed to complete the bending and welding of the metal tube. “Our Branch had supported the local TAD group because it further enhanced the ability of TAD volunteers to assist those with disabilities in our community to enable them to lead more independent lives,” said CWA Evening Branch President, Mrs Margaret Brown. “We are so grateful for the assistance of both the CWA Evening Branch and the Men’s Shed in helping complete this project, which was both exciting and of enormous value not only to Finn but future clients as well,” said John Brumby, the local coordinator for the TAD Group.